Homemade tortilla chips and tostada shells. In a wide pan with high sides, pour in your oil to reach about 1/2″ on sides of pan. Attach thermometer to side and watch temperature to reach 350 degrees. 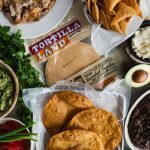 Place one TortillaLand© Corn Tortilla in the hot oil and let brown on one side for 30-45 seconds, using tongs, flip and repeat on opposite side. Place brown toasted tortilla on paper towel lined tray, repeat. To make homemade chips, repeat same process with cut pieces of tortilla, finish with a sprinkle of kosher salt.